Under its agreement with UC Berkeley, the online giant can seek to block the release of public records or redact parts of them. Amazon has operated a location on the Cal campus since January 2016. After Amazon announced last year that it will establish new headquarters in New York City and Washington, D.C., a technology editor for Slate uncovered a written agreement between the online giant and both cities, requiring them to notify Amazon of any public records requests. Under the pact, Amazon could seek to block the public records request in court or redact information before it was released. The Express has learned that Amazon is requiring the same from UC Berkeley in relation to the company’s facility on campus. According to the details of the mutual nondisclosure agreement and lease, which were obtained and reviewed for this report, Amazon’s agreement with UC Berkeley’s ASUC Student Union includes a requirement that the school notify the company of any public records requests made by citizens, the news media, or anyone else and to give Amazon time to request that redactions or exemptions be made from documents that would otherwise be released to the public. Amazon officials confirmed that this language is standard in the company’s real estate deals with public agencies, but declined to comment on the agreements. The company has run a study-space and package-pickup location on the Cal campus since January 2016. Amazon’s director of student programs said that when the space opened, its environment was optimized to be inviting, so that students could be turned into “lifelong customers,” according to a report in Berkeleyside. Some students have long been concerned about the impacts of Amazon moving onto campus. 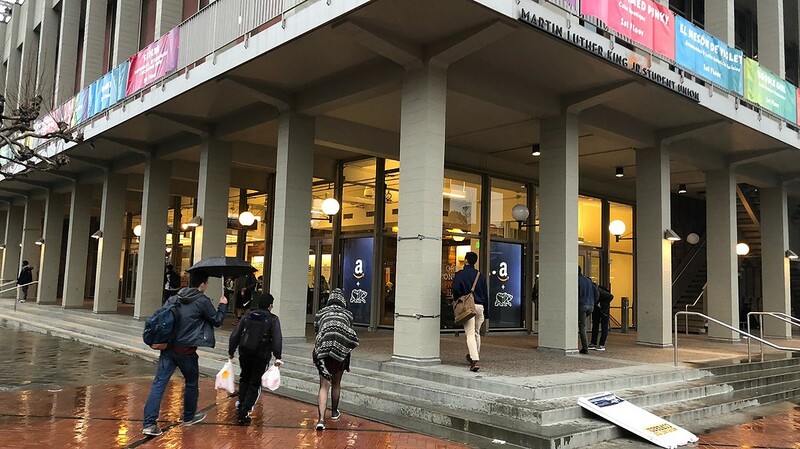 Recent UC Berkeley graduate and Berkeley City Councilmember Rigel Robinson said he thinks that Amazon’s presence on campus — notably, the convenience that package pickup offers to students — has been detrimental to parts of the campus community. “Amazon has decreased the level of student participation in the commercial area on Telegraph Avenue,” he said. Robinson’s council district includes the Telegraph Avenue commercial district. Robinson thinks a campus campaign focused on the benefits of buying local could help mitigate these effects. Although he said he did use the Amazon location on the Upper Sproul Plaza occasionally during his tenure as a Berkeley student, he said he “never felt great” about doing so. “After all, it is Amazon,” he said. California’s state-level equivalent of the federal Freedom of Information Act is the California Public Records Act. Countless journalists, transparency advocates, and citizens use CPRA requests to shed light on government activities and hold officials accountable. Advance notice of such requests could allow Amazon to initiate a “reverse FOIA,” which are cases in which companies take legal action in an attempt to block the disclosure of records about itself. “Public records litigation can already be cost prohibitive for journalists and researchers, and reverse FOIA lawsuits can only amplify that,” said Freddy Martinez, a Berkeley resident and technologist who frequently files public records requests. All requests for government records under CPRA are, themselves, public records — so anyone could ask a government agency to release copies of requests it received. But in this case, UC Berkeley has agreed to always notify Amazon about requests before it discloses any records at all — and potentially before UC Berkeley even replies to the journalist or community member who made the request. If a journalist objected to the redactions made to documents by UC Berkeley relating to Amazon, they might consider appealing or even filing a lawsuit against the university. According to the agreement between Amazon and UC Berkeley, Amazon would reimburse the University of California for legal expenses, such as attorneys’ fees, if the school must defend the changes that it made to documents by Amazon’s request. Under Amazon’s agreement with UMass Amherst — like with Virginia, New York, UC Berkeley, and, in all likelihood, hundreds of other jurisdictions — Amazon would be promptly notified of any relevant public records requests, allowing the company to request exemptions and redactions before release. The UMass agreement included guaranteed payments from Amazon in amounts of $375,000 in the first year, $465,000 in the second year, and $610,000 in the third year. By contrast, UC Berkeley’s agreement lists a guaranteed royalty/rent payment of $200,000 annually for five operational years. Amazon is far from the only large technology company that has sought to secure “early warning systems” for FOIA. Facebook has also demanded advance notification of requests, and reportedly obscured its identity through the use of code names in public documents.